Right, we'll see what's been good lately. 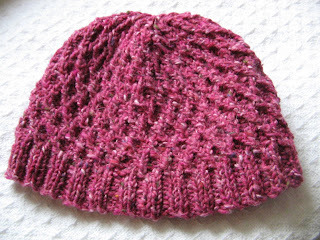 The Koolhaas Hat for Elly is all finished. I very much like how this turned out. I made it smaller than the small size (only three pattern repeats in depth - Elly's got a small head). Ian modelled it for me and I think the size should be just right. 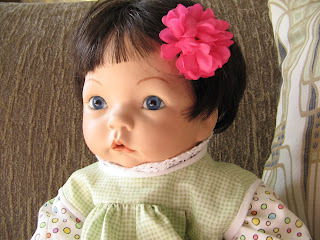 I sent it off to her in a little parcel which should arrive sometime this week. To fill out the box a bit, I made a dishcloth for her new flat. 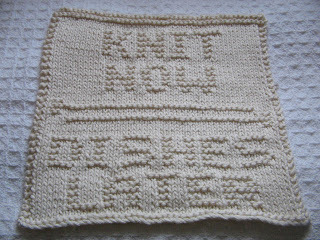 Can you read what it says, "Knit Now Dishes Later". I found the pattern on Ravelry. It's not really advice, more like permission. Made with Pakucho Organic Cotton in the natural colour. Now, everyone who knows Elly knows she's not really a "natural" girl; maybe "Betty Page Red" or "Tim Burton Violet", but not "Organic Cotton Natural", however, it was in the stash and I thought the pale colour might make the words stand out more. To be truthful though, in reality it's very hard to read, it just photographs well. Also good, I made a new dress for Maggie. 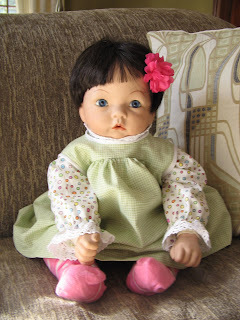 White with multi coloured polka dots, and a green gingham pinafore too. But along with the good, there's also bad. 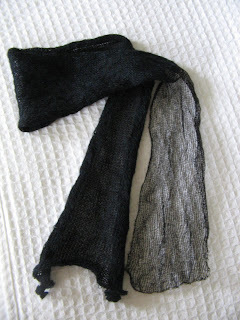 Months ago I admired the Kusha Kusha Scarf and thought it might be a great quick project. 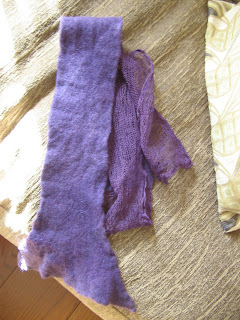 The yarn was very unusual - Habu Silk and Stainless Steel mixed with JaggerSpun Zephyr Wool-Silk. I bought enough yarn to make one in white and one in black. I started with the white, and in no time I'd finished all the knitting. I thought it looked not too bad. Oh, but then - I continued to follow the instructions. After knitting, you're suppose to felt the scarf. Which I did. It was bad. Two-thirds have the felted wool and stainless steel and the other third is only the stainless steel. I love the stainless steel, it's like a moldable mesh. Very cool. The felted part is too stiff. I also didn't care for the colour, when the JaggerSpun was felted the white became more of an off-white. A bad off-white. Icky. I preferred the scarf before I'd felted it. So I moved on to the black one. Better. I won't felt this one. Though I wish I'd just made it with the plain stainless steel - it would have been better still. 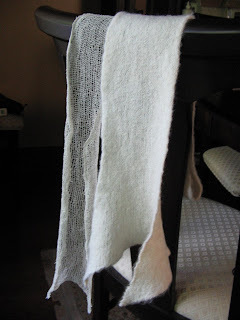 Well, thinking I could possibly improve the white scarf by dyeing it a different colour. 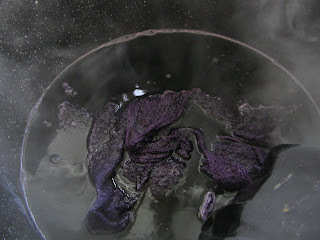 I tossed it into a purple dye bath. The hot water in the dye bath only made it felt further. Now it's almost the thickness of leather. Awful, it's not like a scarf at all anymore - more like a belt. Maggie looks adorable. Too bad about the scarf. Oh! Maggie looks so happy! But as for the scarf I'm speachless.